This article appeared originally in the January 2017 edition of Art Education magazine, copyright © the National Art Education Association reprinted by permission of Taylor & Francis, Ltd on behalf of the National Art Education Association. Sometimes in art class it’s like the same thing, you’re using crayons or markers to color on regular white paper. I liked this project because it was different. You could paint on the cardboard, or collage, or do both! A project like this gave kids like me who have really great ideas a chance to use them. A year earlier I had the same feeling Julie did and I began to wonder why I was teaching my students to create the same thing. I believed that with cookie-cutter, school-arts-styled projects and lessons inspired by the “great masters,” I was providing my students with a well-rounded art education. I speculated about why the curriculum allowed this and why it encouraged this, but I assumed that if it was done this way by art educators before me, then it must be the right way. Still, as my first-graders finished a fresh batch of yellow sunflower paintings I wrestled with my thoughts and wondered about this cookie-cutter approach and if there was a better way. All of this wondering followed me to a new school as I started a new chapter in my teaching career. As I swung open the door to the art room I was met by a rush of hot, stale air, once again reminding me that I was unpacking art supplies in the heat of August. A poorly stacked pile of boxes greeted me in the center of my new art room. As I worked through each box, unpacking its contents and checking it against the supply list, I started mentally planning for the year ahead of me. With the start of this new school year, I made a commitment to myself and to my students. I committed to creating a different type of learning environment in my elementary school art room. Transitioning to a new school pushed me to stop wondering if there was a better way and start searching for one. I no longer wanted my students confined to their tables, following step-by-step directions while assembling hollow meaningless art projects. I wanted to implement a learning environment centralized around student choice, rooted in exploration and powered by creativity and possibility (Gude, 2010). I was nervous about how this would be perceived by the school administration and scared to make the transition at such an early and pivotal time in my teaching career, but I had decided this year was time for change. At my previous school, students received a formalist, discipline-based art education. Every lesson began with students, Pre-K to Grade 3, viewing a thoughtfully selected collection of paintings created by a famous artist. 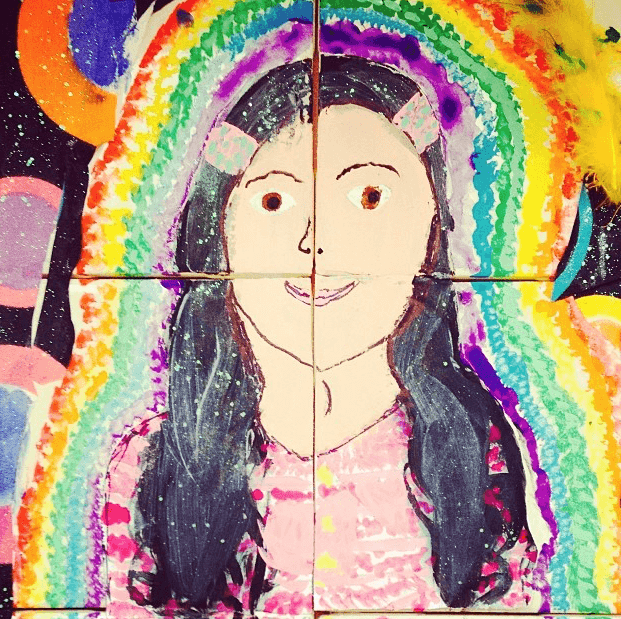 After viewing this carefully curated selection of art work, students would be presented with an expertly crafted teacher demonstration and given step-by-step instructions on how to create their own art projects to meet this idealist model. In my old art room, we created all of the latest and the greatest “home run” elementary school art projects. The oil pastel and watercolor Georgia O’Keeffe flowers, the painted Kandinsky bullseyes, the Picasso inspired self-portraits, each project curated and crafted using art materials and directions that lead to a perfect school arts-styled project (Neperud, 1995). While I appreciated the “oohs” and “ahhhs” created by each new bulletin board display and felt validated when students spouted off a well-remembered art history fact, I slowly started to wonder if there was something more. After years of delivering formal modernist art lessons focused on skills and techniques, I abandoned my discipline-based approach to art education and implemented a postmodern student-centered learning environment into my elementary school art room. Dumping my hollow, bottled art lessons and deserting my step-by-step instructions, I began to create a learning environment where “the students and their ideas are the focus.” “The class begins with them and their artistic pursuits… choosing a medium that will best express their artistic goals and visions” (Henriksen, 2010, p. 3). In this new learning environment, the students are the focus of their own learning and the directors of their art education. The art room serves as a safe place where students are encouraged to engage with their own ideas, experiment with new materials, and explore their own artmaking practice. This was a huge transition for my students and me. 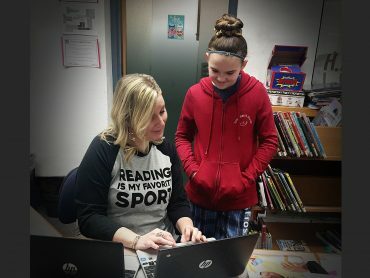 Realizing this change in curricular approach would be an undertaking, I began slowly integrating student choice with my fourth-graders and then gently followed with each grade level. As the students became more comfortable, their artwork flourished. I felt the classroom environment become more balanced and observed that, rather than me providing the answers for my students, we now worked together to problem solve and brainstorm multiple creative solutions to one art-based problem. Making their own artistic decisions allowed students to become more involved in their artwork and engaged in their creations. I found that “through negotiation, our classroom culture was reshaped to provide each student with what they needed and what interested them. In turn, students became committed to their work, and to art as a vehicle for empowerment” (Pennisi, 2013, p. 1). Creating this type of learning environment also shifted my role, the role of the students, and the way in which I viewed and interacted with them. As Stewart and Walker (2005) state, “The role of the teacher must shift from that of one who dictates information to one who is a fellow inquirer as students construct knowledge” (p. 15). Suddenly, I found myself serving as more of a consultant and less of a traditional teacher. Once I began working together with my students to solve problems and find answers, students who previously stared back at me cautiously, waiting for the right answer, began perceiving me as a guide. I was now someone who was there to learn with them and aid them in finding their own answers rather than giving them mine. Three years earlier I had graduated with my BA in Art Education, and after working as a substitute art teacher in my hometown I landed my first full-time teaching position. A full year contract, with health benefits, just far enough away from home to make me move, this job was it. The dream job I had been waiting for. While everyone tells you your first year of teaching will be the hardest, what I experienced felt different. While organizing my way through an art room packed with dusty outdated art supplies, rancid paint, and rock-hard boxes of clay, I worked to navigate my way through dismissive school administrators, absent supervisors, and overly demanding parents. The lack of supervision and support led to mounting feelings of fear, anxiety and confusion. That first year of teaching was the worst year I have ever had, but still when I found the contract for the following school year in my mailbox I signed it with a blue pen and promptly returned it to my school secretary. Year two was even worse. Administrators demanded an organized art room filled with children quietly working at tables while also questioning why students created artwork that all looked the same. Supervisors advocated the idea of a modernist approach to art education while pushing for assessment results that gave data consistent with a postmodernist curriculum. I knew that an authentic and individualized artmaking experience did not come from children all creating the same yellow sunflower painting, but I struggled with how to explain this to my supervisors. Without even realizing it, I was caught in a conversation on the contemporary era of art education and a debate between modern and postmodern theories and practices (Neperud, 1995). Finally, I recognized that before I could educate my administration on the benefits of a postmodern art education, I first had to educate myself. That fall I decided to write a new chapter in the story of my life and began a personal and professional exploration of my identity as an artist and art educator. That winter I applied and was accepted to a low-residency graduate school program to earn my Master of Arts in Art Education. That spring I gave up my condo, left my full-time teaching position, and moved back into my childhood bedroom opting to once again return to the same K-4 substitute art teaching position in my hometown. In a perfect twist of irony and fate the same art teacher I had previously subbed for had her third child and decided to stay home for the full school year. I welcomed the change, the transition, and the promise of uncertainty for the opportunity to continue my exploration and better develop my skills as a contemporary art educator. While the substitute teaching position only offered the promise of a one-year contract returning to positive school community, understanding school administration and happy smiling students was exactly what I needed. The creativity was very high, that’s the kind of art project I like to do the most. As 4th-graders sat with their legs crossed on the carpet, they stared wide-eyed at the TV screen as the movie trailer for “Wasteland” opened to an interview with Brazilian artist Vik Muniz. “What I really want is to be able to change the lives of a group of people with the same materials they deal with every day,” said Muniz. The trailer then cuts to an image of Jardim Gramacho, and pans over the mountains of garbage that create the landscape of the world’s largest landfill. Located on the outskirts of Rio de Janeiro, the landfill has no organized system for recycling and relies on workers called “pickers” to scavenge through the mountains of garbage picking out recyclable items. Born and raised in Brazil, Muniz’s work focuses on the lives, hardships and stories of the pickers. 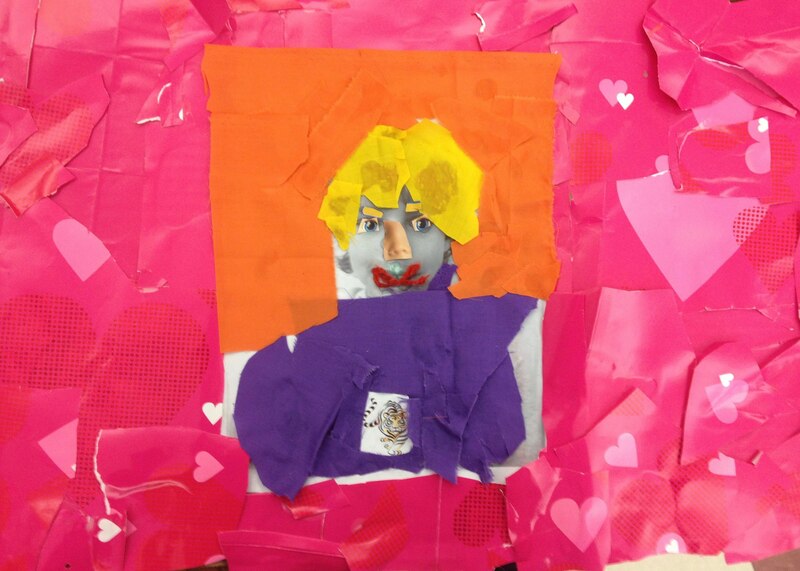 The movie trailer brought students through Muniz’s process of photographing the pickers and recreating their faces in large-scale collaged portraits made of garbage. That question gave me the reassurance that I was onto something and introducing my students to an enduring idea that would inspire them to think deeper. 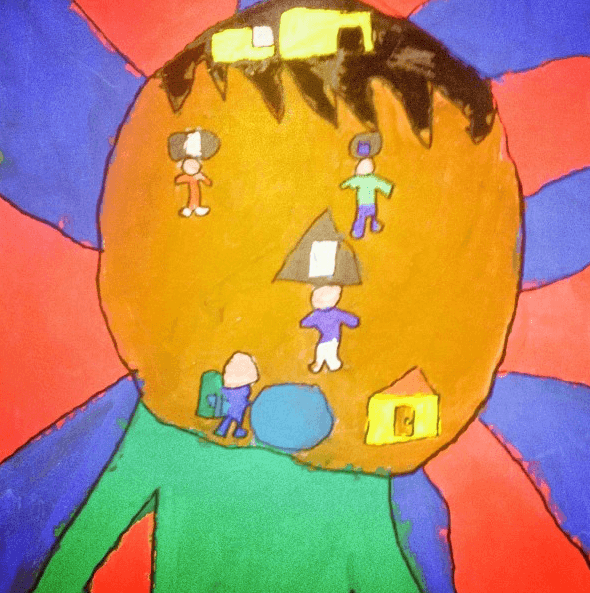 The complexity of a society with no organized system of trash deposal, the ambiguity of forming fine art from garbage, and the contradiction of creating a portrait of a person using the very material that rules their life were all new ideas for this group of fourth-graders. Teaching students who live within a material culture filled with items of a high dollar value pushed me to develop a lesson that placed the intrinsic worth above the dollar value. Inspired by Stewart and Walker’s (2005) concept of Big Ideas, I worked to design my first student-centered lesson around the idea of creating something from nothing. 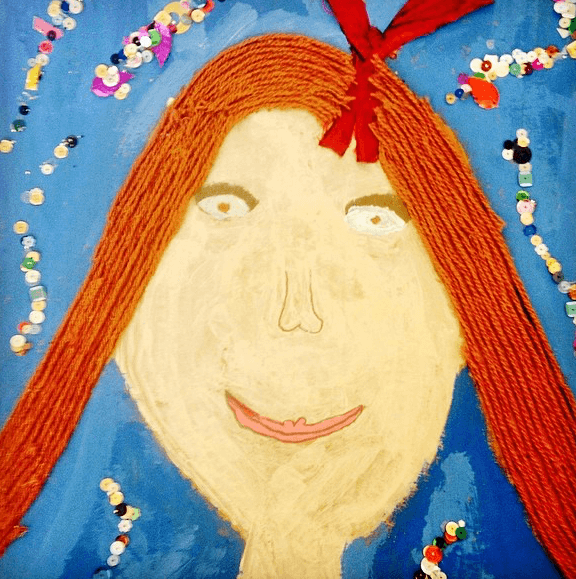 After outlining my expectations for students’ behavior and our classroom goal of respecting the art supplies, tools and materials, I announced to students that their next project would be to create a mixed-media self-portrait using the art materials of their choice. I explained that the students were responsible for selecting and retrieving the art materials they needed, when they needed them and that after finishing their preplanning worksheets they were free to use art class as open studio time. Bubbling over with excitement, my fourth-graders sprung up from the carpet energetically grabbing a preplanning worksheet and returning to their seats. Students began enthusiastically whispering to friends about what art material they would use first and funneling their ideas into quick sketches and material lists. Over the course of the next 10 weeks, I watched as small collaged pieces came together to form faces and once worthless recycled items were formed into priceless works of art. More than their artwork, I noticed a theme emerging among my students. I observed specific patterns in the personalities of my students, their artmaking styles, and most importantly how they reinvented the materials they chose to represent their own ideas. From this theme emerged an unexpected chapter in this story of exploration. Without realizing it, my students had allowed the artwork they were creating to inspire their own stories. I like the idea of making a self-portrait because I can express myself, I don’t really like expressing myself by talking, I like expressing myself by showing. For the first time in my teaching career, I saw my expressive, abstract thinkers and engaged their ideas as possibilities rather than a chance to derail from a carefully placed direction. Another first for me was connecting with my safe and careful creators and feeling disappointment in their inability to explore new materials. Allowing students the opportunity to be the directors of their own art project gave me the chance to observe and engage with them in a new light. Within society, innovators are people who create new methods, invent new ideas or design new products. 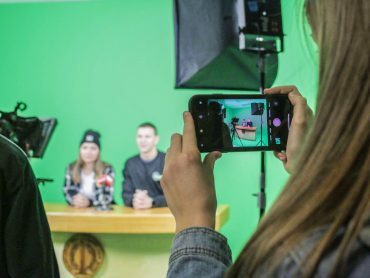 Within the art room, innovators are students who take artistic chances, explore the possibilities of new materials, and view artistic failures as learning opportunities. Innovators are also risk takers who are energized by their ideas and quick to move past imperfections in their work. Often, innovators strive to choose art materials that add meaning to their work and stop to consider how their work will be perceived by the viewer throughout the creation process. On the opposite end of the spectrum I observed the farmers. Within society, farmers are slow and careful masters of their trade. Returning to tried and true methods, farmers follow routines and cycles while consistently working toward an expected outcome. Within the art room, farmers are students who work in rotations—returning to materials and processes they know. Farmers are cautious creators who tend to avoid change and work to collect specifically sourced materials at well-planned moments. Farmers generally fear imperfection and usually work off a strict plan to create artwork that is unified, balanced and aesthetically pleasing. The dichotomy between the innovator and the farmer is that no single student is permanently placed in either category; rather, the goal of creating a great work of art, for any artist at any age, is to find a balance between the two. Identifying and celebrating my students for their differences gave me an opportunity to praise and appreciate them not just for their artistic talents, but also for their abilities to form an identity around their unique and individualized artmaking practice. Gaining an understanding for my students’ personalized approach to creating art allowed me to view them in a new light. Understanding who they are and how they create pushed me to recognize them as more than a name on a seating chart. For the first time, I understood and respected my students as people. Within this student-centered learning environment, we had created a story where my students and I together were both personally invested in the artwork we were creating and excited to see where it would take us next. I was thinking that I could show that people don’t have to be who you think they are and express that using art would be a great way to show the world, kind of like Faith Ringgold. David is an innovator. Describing himself as a collage artist, he focused on conveying a message with his artwork and selecting materials that held meaning. 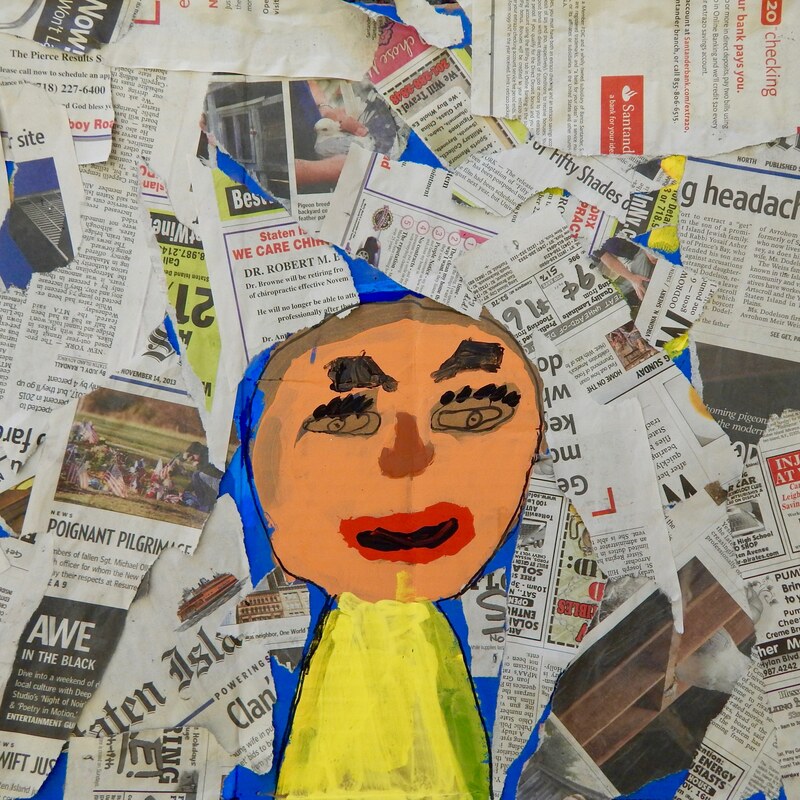 After watching YouTube videos on Faith Ringgold and Vik Muniz, David took on their materials as his own and began creating a collaged mixed-media self-portrait. He used his artwork to make commentary on how “it’s OK to be different” and selected materials that supported his message. David’s artwork reflected his response to a contemporary art curriculum that focuses more on ideas, experiences, and materials and less on academic traditions (Gude, 2009, p. 5). Sharing with me that he was not interested in using paint because it was “too messy,” David developed a plan to use a variety of mixed-media materials. David shared that “no one can know better than you what art material you would want to use.” This statement indicated his ability to flourish within a student-centered learning environment. Starting with a black-and-white photograph of himself, David pasted his picture into the center of a tri-folded piece of cardboard. Intentionally keeping the cardboard as one large tri-folded piece, he shared that he wanted to create a work of art that could stand alone on its own. After securing the photograph, he selected a pink gift bag adorned with hearts and began carefully tearing into the bag. Using the bag to fill in the negative space, David then went back to the pile of mixed-media items and continued his search for materials. When you collage you aren’t showing people your ability, you’re just showing that you can cut out garbage and paste it on. I didn’t want to use garbage because I’m more of a painter. I like to paint. Julie is a farmer. Describing herself as a painter, Julie spent weeks creating a balanced and unified self-portrait that focused on her standards of beauty and realism. After watching the YouTube video on Vik Muniz, Julie stood by paint as her medium of choice and created a painted self-portrait with a small application of mixed-media materials. Julie referenced the successes of self-portraits she had created in the past and used those experiences to aid her in developing a strict plan. While carefully designing her self-portrait, Julie chose art materials and processes she knew to be successful. For art educators, our jobs are different. We have multifaceted roles in and outside of the classroom. Many art educators do not just go to work. They instead see their role as investing in students and teaching as a way of life. To be an art educator means your career, life’s passion and livelihood are often all rolled into one. With the ties we have to our school community and the financial and emotional commitments we make to loved ones and family, it’s difficult to consider leaving a position, even when it’s not working. 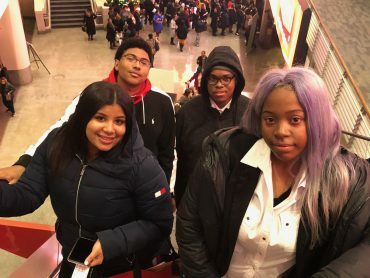 For some, rewriting their story does mean moving to a new school, but for others it means submerging yourself into a community of likeminded art educators and learning how to fight for what you believe in. Understanding the type of learning environment and curriculum you want for your students and educating yourself on how to advocate for this approach is an empowering experience. While most change comes slow and steady, educating yourself on how to achieve it is the first step. After investigating what a contemporary and postmodern art curriculum can offer, I can confidently say that there is a better way. While my story as an art educator continues, my chapter on teaching elementary school art ended with my students that June. Now a middle school art teacher in a neighboring school district, I still work to facilitate a learning environment that allows my students to investigate and understand the usefulness of the arts. With each lesson, I work to give my students an authentic artmaking experience that fosters their ideas, encourages their growth, and gives them the art education they need to go out into the world and create. So if the projects were all going to be hung up in the hall, mine would actually stand out more than most of the other kids because people would go paint, paint, paint… what did this person do? They would know I collaged but at first it would strike them off guard because they would realize there are different ways to do the same thing. Culp, M. (2015). Diving into the creative realm. Art Education, 68(3), 6-10. Gude, O. (2009). Why we need new school arts styles. National Art Education Association. Retrieved from https://naea.digication.com/omg/New_School_Art_Styles. Henriksen, B. A. (2010). 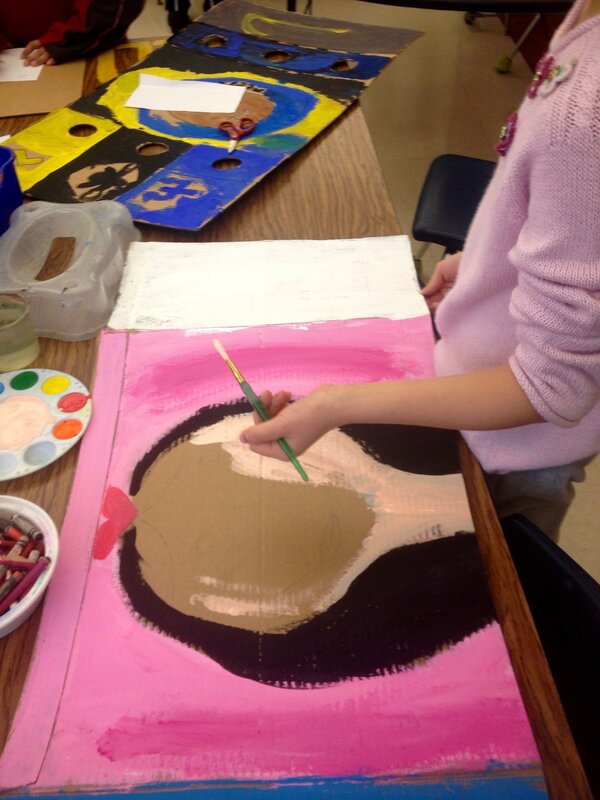 Student ownership: Learning in a student-centered art room. Art Education, 63(4), 40-46. Neperud, R. (1995). Transitions in art education: A search for meaning. In R. W. Neperud (Ed. ), Context, content, and community in art education: Beyond postmodernism (pp. 1-3). New York, NY: Teachers College Press. Pennisi, A. C. (2013). Negotiating to engagement: Creating an art curriculum with eighth-graders. Studies in Art Education, 54(2), 127-142. Stewart, M., & Walker, S. (2005). Rethinking curriculum in art. Worchester, MA: Davis. The art room serves as a safe place where students are encouraged to engage with their own ideas, experiment with new materials, and explore their own artmaking practices.